Certain Western countries have similar laws, such as the Data Protection Act 1998 in the United Kingdom, and the Freedom of Information Act 2000. (See theguardian.com for an article regarding a 2014 Supreme Court ruling regarding the 2000 FoI act and public authorities.) Click on the image for a sample letter to request your data in the United Kingdom. The Watchtower Society collects and stores a variety of records regarding its followers, which are retained even after a member requests to be no longer considered a Jehovah’s Witness. Included are publisher report cards, pioneer applications, and letters to the body of elders when a person moves congregation. In particular, records of judicial committee cases are stored regarding the investigation and discipline of "sin." This account is divided into two parts. The first details the lengthy process I undertook to gain access to my personal records from Bethel, including scans of the legal correspondence. The second part includes scans of the information Bethel holds on file, with a brief description of the background behind each form or letter. The laws drawn upon in this article are specific to Australia and the Australian Privacy Act 1988, and may not apply in other countries. In 2006, I sent a letter to Bethel requesting all records that the Watchtower held about me. The Australian Privacy Act 1988 states a person has the right to request any information relating to themselves, in order to verify the accuracy of the information. Vincent Toole, the Watchtower lawyer for Australia, responded in writing that the Watchtower Society is not subject to the Privacy Act. It took three years, but in the end the Privacy Commissioner found that Watchtower is subject to the Australian Privacy Act 1988, and they were required to release my documents. It needs to be noted that I was only able to receive copies, and the originals are still stored by the Watchtower Corporation. I was advised by the office of the Privacy Commissioner that if any information appeared incorrect, then it would require lodging a separate request for that information to be destroyed. There was no explanation as to why the Watchtower was not covered by the Privacy Act so I rang Vincent Toole for an explanation. As he refused to divulge the reasoning, I advised him that I would refer the case to the Australian Privacy Commissioner. A representative for the Privacy Commissioner spoke to Vincent, who explained Watchtower is not covered because they do not have over $3 million turnover, one of the requirements to fall under the Act. Watchtower provided the Commissioner with a signed Statutory Declaration to that affect. On this basis, the Privacy Commissioner closed the case. 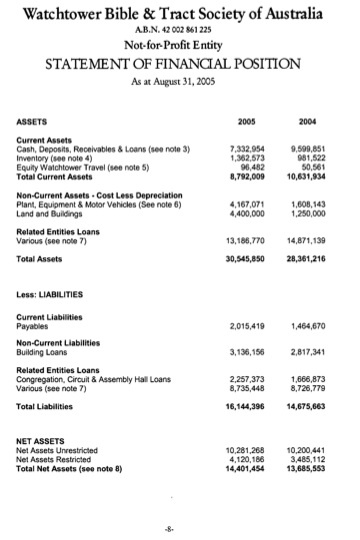 I was fairly certain the Australian branch of Watchtower turned over $3 million per year so purchased the 2005 financial report for the Watchtower Bible and Tract Society of Australia from ASIC (Australian Securities & Investments Commission). This showed annual turnover of $16 million. I conveyed this to the Privacy Commissioner, compelling them to reopen the case. Watchtower responded that they do not fall under the $3 million turnover requirement, on the basis that the $16 million is mostly unsolicited donations. They quoted the taxation definition that turnover does not include donations for tax purposes. The Privacy Commissioner argued that the law was written to encompass the broader meaning of turnover to include donations. The Privacy Commissioner was reluctant to pursue the case without absolute certainty of the correct rendering of the law, as they expected the Watchtower would drag it through the courts and they did not want to incur the substantial cost without being certain of winning. They were also conscious that this case set a precedent that affects all Australian religions and charities. This resulted in a 3-year period with both the Watchtower and the Privacy Commissioner involving external lawyers to determine the definition of turnover. In 2009, after a period of 3 years, the Commissioner received legal advice that for a certainty the definition of turnover in the Privacy Act was intended to include donations. They wrote back to Watchtower once again demanding they hand over my documents. To my surprise Watchtower conceded and sent a letter to the Commissioner that they would be posting me my documents. I called the Privacy Commission officer, who also expressed surprise that a further appeal was not lodged. I requested from the Commissioner a copy of the letter, but the Watchtower specifically stated in the letter that I am not to be given a copy. To get a copy I would need to send a request to the Privacy Commission, after which they can determine if I am legally entitled to see it. I chose not to do so. Shortly thereafter, I received a covering letter and corresponding documents from Bethel. The documents are somewhat incomplete, missing my extensive Bethel application and Vow of Poverty. Also missing are details of a judicial committee meeting I had attended that resulted in my being "publicly reproved." It was nevertheless surprising to receive the package and see the amount of information that is being stored. They range from mundane, such as handwritten letters of recommendation and report slips, to highly detailed when outlining the process to disfellowship me. I also received a letter from the Privacy Commissioner closing the case. 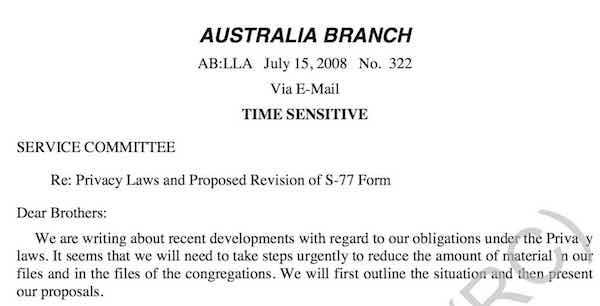 In 2017, I received a copy of a letter sent by the Australia Branch to each congregation Service Committee, dated July 15, 2008. It specifically related to the action I had brought before the Privacy Commission. This letter explained the upcoming ruling by the Privacy Commissioner would necessitate retaining less information on individual Jehovah's Witnesses. It went on to explain why they did not continue to appeal the case. 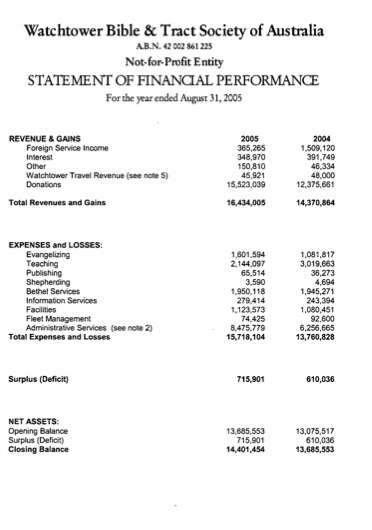 "It has been our position that turnover does not include contributions or donations. However, the Privacy Commissioner has ruled against us on this question, and we are appealing his decision. It is highly likely that in a few weeks’ time we will be directed to comply with the Act. We can appeal this decision, but we doubt that it will succeed. An appeal with resultant publicity may give the impression that we have something to hide. Our immediate concern is that the Privacy Commissioner’s involvement arises out of a request made by a disfellowshipped apostate. We believe that this person will advertise the fact that we have been forced to give him access to documents we hold concerning him, and he will invite others also to request access to documents we may hold about them. While there are other records held by both the branch office and congregations that will need further consideration, we would like to give our first and immediate attention to records relating to judicial matters. We are enclosing a suggested revision of the S-77 form for use in Australia. It is designed to minimize the information contained on the form, and to avoid the recording of undesirable expressions when completing the form. We have headed this letter “Time Sensitive” because we hope to be able to minimize the records of persons who may be potential trouble-makers before direction is given by the Privacy Commissioner." 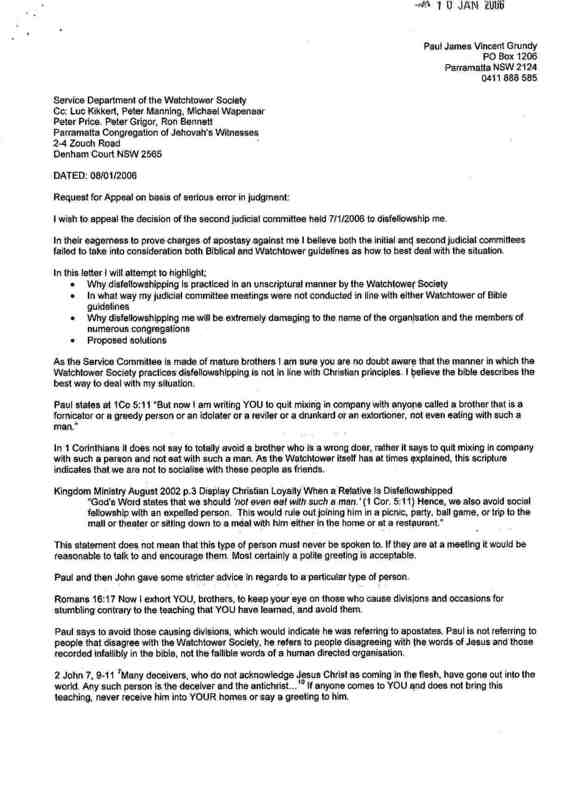 I am proud to be the "disfellowshipped apostate" referred to in this letter, and that my actions mean that in Australia Watchtower now holds less invasive personal information on Jehovah's Witnesses, and will hand over this information if so requested. The files I received trace a path through my life as a Witness; applying to be a pioneer in 1987 at the age of 17, appointment as a Ministerial Servant at the age of 20, being assigned as a family to leave Hobart and move to Sydney at 21, going to bethel at 22 and finally being disfellowshipped at 36. For each of these events either the congregation or Bethel stores a form or letter. I was accepted into Bethel in 1992. At that time, Parramatta congregation was vibrant, with over 20 pioneers and rich social life. I was assigned to remain serving Parramatta and continued to enjoy the association of the congregation - excessively in the minds of the Bethel elders. Later that year I was reassigned to Bradbury congregation due to its close proximity to Bethel, proliferation of Bethelites and limited opportunity for entertainment. A letter was sent from Parramatta to Bradbury recommending me as a Ministerial Servant. "Although he had served as a ministerial servant and was serving in Bethel it was felt that he had no longer qualified due to his pursuit of worldly entertainment and music … Entertainment appeared to still be a major problem. Paul craved night life and worldly entertainment. … He also spent a lot of time with some of the single sisters and was perhaps overly familiar with them, not in a physical way but in an emotional way." It is incomprehensible to me now that as a single 25 year old virgin male, I was chastised for liking music, entertainment and being overly familiar with sisters, not in a physical but “in an emotional way.” Entertainment was hardly excessive, as I was spending 7 days a week in Watchtower service and restricted by the Bethel Vow of Poverty to a $26 a week allowance, and hence consistent mainly of visiting Witness families. After I left Bethel I spent a number of years going through the motions in Parramatta congregation. I knew Watchtower doctrine did not make sense if considered at any length, but did not go the next step to prove beyond doubt why. I did not really want to know; life outside the religion was too fearsome to contemplate. Losing all my friends and family is not easy to plan for. I stayed this way for ten years, until I could no longer bear going to meetings and listening to the ridiculous, condescending information. In late 2004, during a shepherding call I confessed my lack of faith and was told to do more research. This meeting is referred to in a report from the Circuit Overseer to Bethel. This put in motion the series of letters and events between 2004 and 2006 that resulted in my disfellowshipping. I was not aware until the documents arrived that in early 2005 I had been "marked" in a special needs talk. What is remarkable about the 2005 Circuit Overseer's report to Bethel is the claim I told the elders I did not believe in God or the Bible, but that; "Non-belief is not a judicial matter." Nor could I be classed as an apostate, as I had not tried to influence others in the congregation. Doing further study to build my faith, as advised by the elders, is what led me to identifying that the Watchtower Society fits the definition of cult. My last meeting was the March 2005 memorial. In May 2005 I established jwfacts.com anonymously, but eventually the website was identified as belonging to me, which initiated judicial committee proceedings in December 2005. The drawn out process that ensued from December 2005 may seem like a waste of time, but I wanted to try every avenue available to avoid being disfellowshipped and shunned. I also wanted to document the process in case it could assist others. However, there was little hope for me to avoid being disfellowshipped due to my website and being well known at Bethel. In December 2005, elders arrived at my door unannounced at night requesting I attend a committee hearing. I refused. Attending opens opportunity to being disfellowshipped as it shows you recognise the authority of the elders and are "admitting accountability to the Christian congregation". By refusing to attend a judicial committee, some people that have not attended meetings for a long period can potentially avoid any further action. I approached a lawyer, who sent each committee member a letter that I will sue if an announcement is made about me at the kingdom hall, as it would constitute defamation. The lawyer had coincidentally studied cults from a legal perspective and advised the letter was unlikely to be successful, particularly as the announcement to disfellowship is very vague. I also sent a letter to Bethel requesting that my baptism be annulled on the basis of being a minor when baptised. My lawyer was correct; the first committee meeting was held in my absence and it was decided to disfellowship. An appeal is permitted within seven days so I appealed and attended the appeal meeting in January 2006. Six elders, including 3 Bethelites, a Circuit Overseer and an elder with expertise in websites attended. (See judicial committee meeting for a summary of the meeting.) It was reaffirmed that I would be disfellowshipped. I lodged a second unsuccessful appeal letter and was disfellowshipped on Thursday 13th January 2006. The following documents outline the lengths the elders went to in order to prove I should be considered apostate. 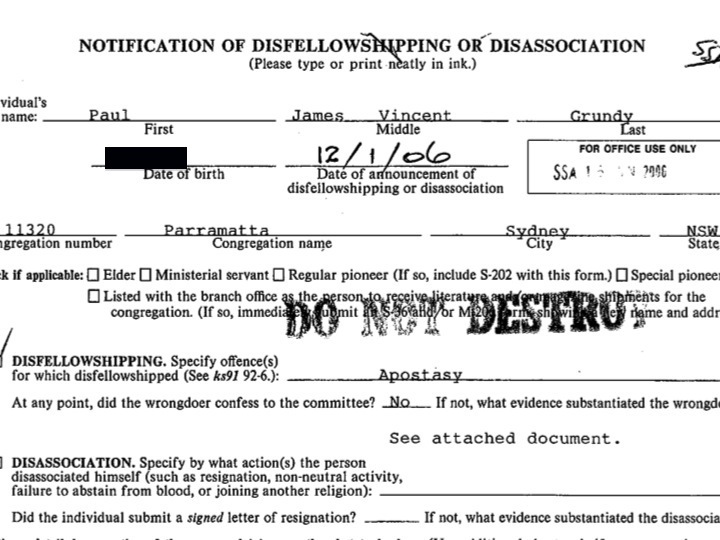 There is a wealth of forms and corresponding documentation that are held in the files of both active and disfellowshipped Jehovah's Witnesses. Considering there are 7 million publishers and another 1 percent of Jehovah's Witnesses that are disfellowshipped every year (over 60,000), that is a lot of filing cabinets. Why bother to go through all the effort and emotions to gain access to these files? To remove some of the mystique and prove that the Watchtower Society is not above the law. Though its leaders hide behind terms such as "directed by holy spirit" and "faithful and discreet slave" to dictate to and Lord it over glassy eyed followers, it is simply a legal, worldly corporation run by men. Written 2009, latest update July 2017.